​The other day I spent my morning doing something none of us ever really like to do, attending a friend’s memorial service. Funerals are not a new experience for me; there have been seasons in my life where memorials of someone’s life were a frequent occurrence. And the one thing they all seem to have in common for me, is they always take me to the same place…. What will be said at my funeral in memory of me? This service seemed different though, and this caught me off guard. There were beautiful flowers, touching songs of praise and moving words of honor and reflection, and a church full of family and friends. ​But there was also a testimony and some words retold which sprouted a desire down deep in my brokenness as soon as they fell on this turned over and plowed heart. My friend's testimony. My heart’s desire. To be so close, to feel Him so near. To cast away any and everything in between. To reach out with this hopeful hand and touch Him. Matthew tells us of such a woman; a woman who cast aside all else to be in Christ’s presence, to reach out and touch Him. ​Jesus has found himself in Bethany at a friend’s house and, as usual, he was among his disciples. And there was “a woman”*. A woman that was so close to Jesus, that she DID reach out and touch him. Now this wasn’t just any oil, this wasn’t the common oil used for medicine or everyday household purposes. No this was expensive, ‘pure nard’ and cost the equivalent to almost a year’s wages. It could have likely even been everything she owned and her dowry that she was saving to bring to her marriage. This woman made a great sacrifice to touch her Lord. Am I holding close to my precious things instead of being close to God? What am I truly sacrificing so I can touch Him? Do I gather and hoard more than I need, not trusting God for provision? Now this was a very bold move on her part. In her time, women did not congregate with men in this manner. But near to her presence is her Lord. She casts off convention, as she shamelessly makes a path through this group of men to reach Jesus. Once in his presence and within touching distance, she unapologetically expends this most precious dowry on Jesus with no consideration of what the others present will think. She must have known how it would look. She must how known what they might say. But with no shame for her very public, very expensive, very personal expression of devotion for her Lord, she stepped out and followed through. Am I holding back my expression of worship because I am worried about other’s opinions? Do I let what other’s may think is a waste keep me from expressing what God thinks is a beautiful thing? Am I letting my fear or my faith influence my decisions? Jesus speaks up to defend this woman’s expression of devotion. He shields her from their criticism. He creates a safe and secure and sheltered place of worship and relationship for her. As the church is the bride of Christ, and this woman is part of the church, He quite openly defends the honor of his bride and creates a safe boundary around her. Secure in His love for her and confident of His Lordship, she shamelessly steps out to render the most grand sacrifice she can offer, having no idea of the sacrifice He is about to make for her … and for you and for me. Do I let insecurities in my ability override my security in God’s ability? Do I say “no” to God because I can’t see what He is about to do? Am I the inattentive bride, not expressing my love for and devotion to my Lord? Because of this woman's selfless expression of devotion toward Jesus, He has selected her as an example to be shared generation after generation whenever and wherever the word of His gospel is shared. He knew I would read this passage. He knew you would read this passage. He knew of everyone who has and about everyone who is yet to read Matthew 26:6-13. 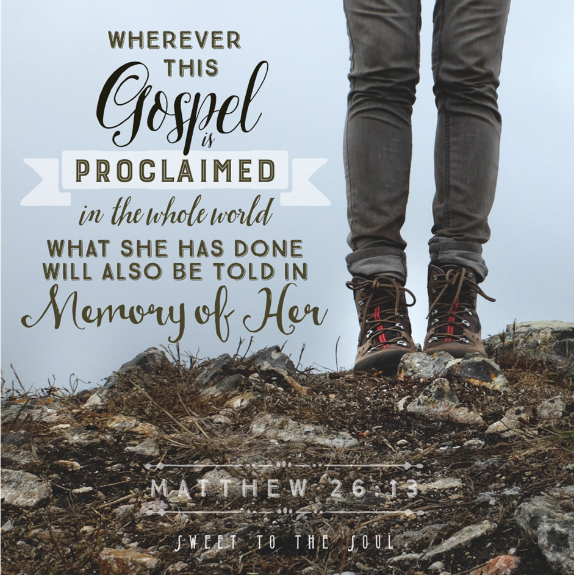 And He dedicated these words to be spoken in memory of her, as a testimony to us. Someday, someone will speak words in memory of me; will they be similar to these? Will I be remembered as loving my Lord sacrificially? How about living securely in His love for me? For sure I will not, if I do not. I would love to hear your thoughts? Will you join the conversation in the comments below? ​This post is part of the series Blogging Through The Bible with the Good Morning Girls [Matthew]. To follow along please visit GoodMorningGirls.org. ​​Soul Friends is a group of Christ loving women who want to share their #graciouswords and stories of God’s greatness and blessings in their lives with others. So join us here, and make not just new friends, but #SoulFriends. 1. Link up your inspiring post with the button below. 3. Don't have a blog? No worries, leave your encouragement in the comments. 4. Share the love! Leave an encouragement on the blog linked up in front of you & then visit others to soak in their bone healing words. 5. Retweet the blogs you love, using the hashtag #SoulFriends, and inspire others! Love your blog and the heart check questions. Very thought provoking. I pray that I don't hold back my heart from Him. I think every time I read this I will now do so with a view of her being representative of the Bride. That gives an added dimension to an already incredible story and I can't wait to explore that further. Great insights!! Yes Angela. Seeing her this way just seems to make is to much more personal. It's like we are getting a glimpse into this very private and personal moment. The way He honors her sacrifice. I've read this story so many time, but it just spoke differently to me today. Thank you for this gentle reminder of the relationship we have--not just a religion. This question really gets my attention... "Do I let insecurities in my ability override my security in God%u2019s ability?" Wow. My prideful self wants me to ignore that question, lol. I wonder how many times I've gotten in the way of what He wanted to accomplish just due to my own insecurities? I'll be chewing on all this goodness for a while, Jana. Thank you, friend! This is a beautiufl post! Thank you so much for sharing... I am your linky neighbor at #LifeGivingLinkup - my first time joining... Love connecting with you on Twitter. I am sorry to hear of the loss of your friend, these are some very insightful points... I love the "heart check" parts. Blessings to you and keep shining for Jesus! Oh sweet Jana, I need a heart check in all those areas for sure! Thanks for sharing all that you have gleaned from scripture so that I can study it too. Love all you are doing with Sweet to the Soul. You are making a difference! I think about my memorial service too. I pray it will be more about Jesus. The final moments of this friends' life sounded just precious.